"One, download and install Google Earth." "Two, visit our web site and click on the link 'Total Electron Content.'" 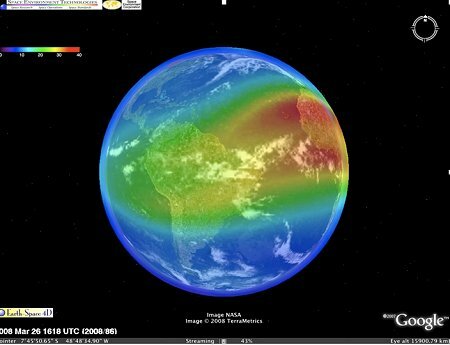 In addition to total electron content, the 4D model also can be configured to display available radio frequencies, maximum usable frequencies, and the critical "bounce frequency" of the ionosphere's f2-layer—terms well known to hams and other experts. The corresponding files are all available at the CAPS web site.